Now you can backup your iPod files to PC and vice versa without using iTunes! Besides supporting and working like the iTunes, Xilisoft iPod Convert can convert, copy or backup your iPod music, videos, photos, podcasts, ringtones, eBooks and audio book to PC. You can even sync songs between iTunes and your iPhone/iPod. Photos and videos shot by the device are supported as well. 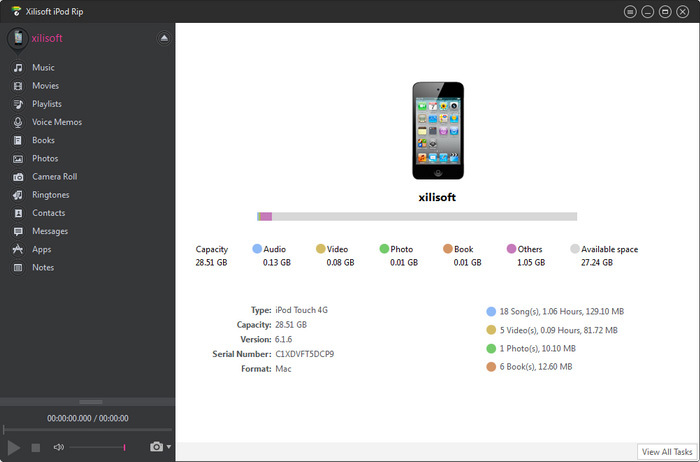 With Xilisoft iPod Convert, you can now manage, browse, convert, copy or backup files easily. Copy your iPod music, movies, music video and pictures to computer for backup or sharing with friends. Photos and videos shot by the device are also supported. Easily transfer files from iPod and iPhone to iTunes for backup. Also support transfer playlist to iTunes. Wanna share your iPod touch music with friends? Or copy music and videos between iPod and iPhone? Just connect them at the same time drop, and transfer files among them by drag-and-drop at ease! Copy files from one device to another now. All iPhone types (iPhone, iPhone 3G, iPhone 3GS, iPhone 4, CDMA iPhone 4, iPhone 4S, iPhone 5, iPhone 5s, iPhone 5c, iPhone XS, iPhone XS Max, iPhone XR, iOS 12) are supported now. All iPod types including iPod, iPod nano, iPod classic, iPod shuffle, iPod Mini, iPod touch, iPod touch 5 and even the new iPod nano 5, iPod nano 7 are supported in this iPod copy software. Manage iPhone as a hard disk by means of opening iPhone with Windows Explore to take full advantage of your iPhone. Create, delete and rename photo albums to organize iPod pictures. Copy photos from photostream to computer. Add one photo into multiple albums as you wish. Transfer, rename and manage iPhone ringtones and eBooks freely. Offer various view modes for music, movies and photos: Song, Albums, Artists, Genres, Composer view modes for music; Movies and Genres view modes for movie files; Photo and Albums view modes for photo files. All information about your iPod, such as iPod picture, type, capacity, version number, serial number and format, will be clearly shown on the main interface. With this handy iPod backup software installed on your iPod, you can copy iPod to PC and transfer iPod files between iPod and computer on any computer. Much easier and handier than iTunes! This iPod ripper may be the easiest way to help you copy and backup iPod to PC, transfer files between iPod/iPhone, PC and iTunes. Super fast beyond your imagination with more time saved! Just enjoy your movies and music in a quicker way. 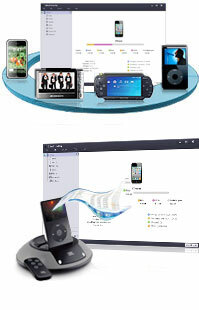 Transfer application between your PC and iPod, manage document for the application which supports this operation. Dragging and dropping apps is supported newly. Start to play iPod files with system default player from right-click menu for your convenience. Provide many shortcut keys for operation for users' convenience.